there are islands that lie in the North Sea. At one time they belonged to the King of Norway, a Viking King. and Earl Magnus, also mighty in battle but gifted in peacemaking. until evil men gained the ear of Hakon and turned him against Magnus. persuaded the two earls to work out their difference diplomatically. ​ during Holy Week to make their peace. by just enough men to fill two small boats. Magnus and his companions arrived first. He went into the small church on the island to pray. he saw that there were not two boats approaching but an entire fleet. He knew his men were out-numbered. Again he knelt in prayer. in the sparse and rocky field in front of the church. with his arms outstretched in peaceful welcome. ​“Let us sit together and talk out our differences. Do not break our oath of peace. ​to protect you from doing wrong and breaking your oath. I will go to Jerusalem and pray for us both there. “What if you change your mind?” he grumbled. Magnus sighed and said, “Then I give you a final choice. “And make you a hero in the eyes of the people?” roared Hakon. And with that he beheaded his cousin Magnus on that very spot. which was full of moss and not good for any kind of farming. It was the kind of field that fostered very little life. However, that spring the field grew lush and green with grass. People came there to pray and sheep came there to graze. to be with the Holy One in Paradise. and granted the Orkney Islands a bit of Paradise. Magnus died with God and rose with God. And the field is the witness. We have many events for participation. Yet I think that each year we have a choice at Holy Week. We can through the liturgical motions vaguely remembering the stories. Or we have the choice to participate letting the tangible and intangible power of resurrection sink deeper into our bones as we go through the week. As in the story above, Hakon came to participate in reconciliation and peacemaking, yet he had not chosen those things in his heart as Magnus had. So he was not willingly to let the power of making peace take root deep down. Will you choose God’s power of resurrection this year despite the evidence in our world that conspires against it? External political and social circumstances in our world may rarely give us direct and factual cause to hope for resurrection. Will we choose fear or will we choose compassion and life? The usual stresses of daily life, family concerns and friends who are in need are never ending. Will we choose peace or further engagement in the surface turmoil? The traditional lectionary scripture texts for Easter Sunday urge us toward hope in the midst of tragedy and despair. In the face of our “realities” we can choose to trust and affirm that God is “about to create new heavens and a new earth” (Isaiah 65:17). Choose to trust and affirm that “the stone that the builders rejected has become the chief cornerstone” (Psalm 118:22). We can choose with Paul to affirm the testimony of good news handed to him by the first disciples, testimony that he has handed on to us in I Corinthians 15. Christ died, was buried and was raised on the third day, appearing first to his closest disciples, then five hundred other followers and lastly to Paul on the road to Damascus. Ironically the Gospel of Luke tells us that the first twelve disciples did not believe when the women who experienced the empty tomb returned and proclaimed the good news. The men thought it was “idle tales,” make-believe. Crazy emotional women! But then Peter, who just thirty-six hours before Easter morning, denied that he even knew Jesus, decided in his inimitable style to choose ACTION in response to the news. In spite of his disbelief and despair he chooses to run to the tomb to see for himself. Will we respond like those first disciples and not take the news of resurrection to heart? Or will we allow the power of God to cultivate our lives and like the sparse, rocky, lifeless soil of the Orkneys become rich, fertile soil full of prayers and promise for Paradise? This year I challenge us all to take Peter’s choice to heart, to act on the news of resurrection. To go and see for ourselves. To let the deep roots of God’s salvation sink deep within our souls. May we choose to trust the biggest story of our faith. It is not a choice to take lightly. And it is not the safest choice. But it is the resurrection choice. And just as that ancient man, Magnus, following the example of Jesus, chose life in the face of betrayal, God will also work through us and our choice. May your Holy Week be blessed as you walk the road into Jerusalem, find the upper room and then the garden, follow to the cross and finally to the joy of the empty tomb. We walk together with God’s presence step by step! ​4/18, Thursday evening soup supper at 6:15 p.m. in the Fellowship Hall and Maundy Thursday/Tenebrae service at 7:00 p.m. Soup provided by our Board of Deacons. 4/19, Friday noon to 1:00 p.m. the sanctuary will be open for Good Friday meditation with candles for lighting and personal prayer/meditation prompts. Come and stay as long as you like during that time. 4/21, Easter Sunday services at 9 a.m., 11 a.m. and 6 p.m! If you are able-bodied, please park in the Islamic Center parking lot for the morning services! Easter Egg Hunt for pre-school and elementary children at 10:20 a.m. Meet first in the Kids Club Room in the North Wing. Bring your own basket! Being part of a congregation makes each of us aware of the transitions of life: births, baptisms, confirmations, graduations, marriages, retirements, and deaths. Being an intentional part of a community of faith exposes us to the exigencies of what it means to be alive. Just by being engaged during Prayers of the People in worship, we tend to hear about and pray for more people experiencing illness or loss than many of our neighbors do. We are in a time of passage for three of our members: John Geter, Ruth Minter, and George Bryan, for whose lives we offer God thanks with the rites of the church, helping provide a ritual marker at the close of this life. Jake led John Geter’s memorial service on March 30, and I hope that you will join us for memorial services for Ruth Minter this Saturday at 11:00 a.m. and for George Bryan on Holy Saturday at 11:00 a.m. When Jane Anne and I arrived in Tokyo at the end of March, a few cherry blossoms were just beginning to emerge from the buds on early-blossoming trees. Viewing the cherry blossoms is a major celebration in Japan called hanami, which dates back centuries when the aristocracy would have viewing parties that included food and drink under the white-and-pink canopy of blossoms. While today thousands crowd into parks and picnic under the trees on blue plastic tarps, the spirit of hanami remains. We had wonderful travels around Japan with my son, Cameron, and got to spend a few days with him and his wonderful girlfriend, Aki Regan, in Akita Prefecture, where they both teach English. 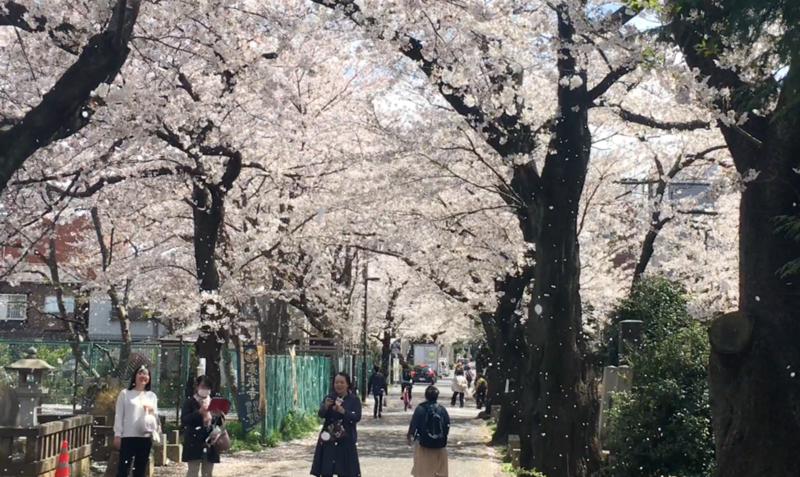 We returned to Tokyo as we concluded our two weeks in Japan, and by then many of the trees were a profusion of pinkish blossoms, though some trees had begun to lose their floral array. As the wind came up, the blossoms swirled through the air like so many large snowflakes, and I felt a sense of melancholy rising up as the season was drawing to a close. I was standing in Yanaka Cemetery in Tokyo when I filmed the video clip below, so the end of life was already present in this place of beauty and remembrance. 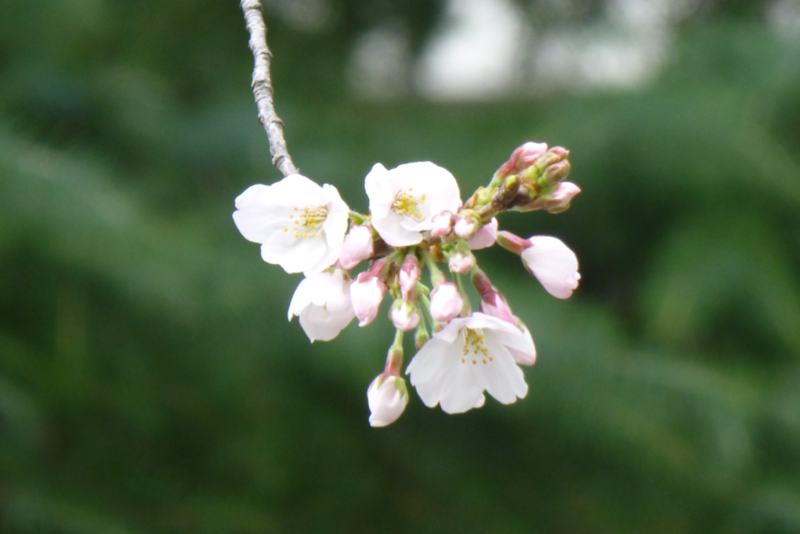 Our own tradition, though without hanami, acknowledges the transitory nature of life. The first hymn in the New Century Hymnal, “Immortal, Invisible, God Only Wise,” contains these lines: “We blossom and flourish as leaves and as flowers, then wither and perish – but naught dims your powers.” The nature of life is indeed transitory. And our tradition also tells us that in the midst of every transition, the power of God and companionship of the Spirit are within and among us. “In life, in death, in life beyond death, we are not alone,” says the New Creed from the United Church of Canada. As we move into spring in Colorado, and as we walk through the pattern of Holy Week, going from the triumph of Palm Sunday to tragedy of Good Friday to the triumph of Easter, may we each remember that death is never God’s final word. Thanks be to God. “Home is where the heart is.” That saying has been around for so long that historians of language and idioms do not even know how long it has been in use, although there are written records dating back to Pliny the Elder (23-79 CE). When I hear this phase, I am brought back to childhood memories of Christmas mornings, Easter Egg hunts (mom hid the eggs so well we would keep finding them throughout the summer months), puppies, and lessons learned in time out. I spent a lot of time in time out. I am sure that many of you have your own stories of home that make this phrase resonate, but we all agree that home is the source of stability, nurture, and health in most of our lives. Public Health professionals universally agree on this point. For an increasing number of people, especially those in natural disaster zones, home is where the stress is. Home is where the uncertainty is. Home is where the instability is. Home was there, but then a hurricane, flood, or fire took it away. This is a place where we can help make a difference, as a church, and return heart to home. From April 28th through May 4th, for a week, Plymouth’s Outreach and Mission Board and our Habitat for Humanity Ministry Team have commissioned our first Adult Mission Trip since the end of our Navaho Mission Trips a half-decade ago. With Outreach and Mission Board member Lynn Wartgow leading, Plymouth volunteers Anne Wuerslin, Jeff Wartgow, Nancy and Bob Sturtevant, Vanessa Reed, Bruce Lieurance, and myself, along with friend of Plymouth Belinda Strickland, will be going to Sebring, Florida to help build houses for hurricane survivors—the same hurricane Plymouth responded to so generously with a special offering two years ago in the immediate aftermath. The fact that we first sent dollars and now are sending a real group of people to make a physical difference is a sign of healthy systems-changing mission rather than just charity. The Board of Outreach and Mission believes that bringing back organized Adult Mission Trip opportunities through Habitat for Humanity helps us fulfill the sending part of our mission as a church and to make lasting change while building relationships. After sending Lynn Wartgow to Minneapolis be trained as an official Habitat Mission Trip leader, we chose Sebring as our first mission opportunity because of our existing connection to that place and the need. If it goes well, there will be more similar trips every year, and we invite you all to consider going. Moreover, the board feels that having Adult Mission Trip opportunities brings us closer, as a board, to fully living out our mission in Fort Collins and the world to “send” people out of our comfort zone for hope and transformation. Plymouth’s Mission Statement: It is our mission to worship God and help make God’s realm visible in the lives of people, individually and collectively, especially as it is set forth in the life, teachings, death, and living presence of Jesus Christ. We do this by: Inviting, Transforming, and Sending. Jeff Wartgow: James, the very brother of none other than Jesus, must have possessed the genetic propensity for a desire to do good works. He certainly talked about its importance and is a good role model for us. I believe Habitat for Humanity is a reflection of how we can participate in expanding on that model, the realm of God's presence. I'm going to Sebring with our Outreach and Missions Habitat group to in some small way help rebuild shelter for a few of God's children so badly affected by hurricane Irma. Lynn Wartgow: There have been times in my early life where I experienced housing insecurity. I hope to help others avoid that painful experience. I love to build and I love to travel, so working with Habitat International (which includes domestic trips like this one) is a perfect fit for me. When you have the opportunity to work as a team doing any kind of mission work, you create "family." I'm looking forward to growing my family at Plymouth through this Habitat trip. Nancy Sturtevant: We feel that Habitat is an important program, and this is a good way to take Plymouth into the community. It allows us to volunteer as a couple for an important cause while getting the opportunity to become closer to other Plymouth members. Bob Sturtevant: Habitat is a great way to be a part of something bigger than ourselves. We can show people that we care through giving our time and energy to help them get back into a home after the devastating hurricane. We can use whatever house-building skills we may have to make a difference in the life of a family. Belinda Strickland: One of my favorite quotes comes from St. Francis, "Preach the gospel at all times, if necessary, use words." I believe the best way to show the love of Christ is through our actions of outreach. I have just retired, and this Habitat for Humanity trip is the first of my post-retirement efforts to increase my outreach efforts. Vanessa Reed, long-time Habitat worker: Not only do l enjoys getting my hands-on building tools but using my hands to give back to my community or to anyone who needs a helping hand. This is my passion. A special thank you to Lynn Wartgow for sensing God’s calling to this work of leadership and investing the time in the trainings and certifications that will make this possible, to Habitat for Humanity of Fort Collins Faith Relations Manager Erika Nossokoff for inspiring our potential to see what God will do next with our team, and to the whole Plymouth congregation for your prayerful support of this mission opportunity for adults. Throughout our days in Sebring, I will be sending a daily photo dispatch and written prayer on Social Media and in our email news about what is happening and where we are finding God and transformation in this work. I will also provide an “after” Reflection summery the first Tuesday in May about the mission trip. to remember our story of faith, and our connection to each other. We need your water, waters of healing and comfort, waters of hope, waters of welcome. We need your fruit, fruit of commitment, fruit of determination, fruit of inspiration. deserts of water in the Midwest flooding, and deserts of sand. praying for a new community to welcome them. calling us to sit together at the same table and be One Human Family. The Doctrine of the Affects was a popular theory of aesthetics in music during Bach's life. Based on ancient principles of rhetoric and oratory, the composer sought to embody concepts such as joy, sadness, or sorrow into their music through the outward constructs of notes and rhythm. Bach's intent of channeling the divine through his music then was given a viable path to our ears. For myself, playing Bach is always an experience where new ideas for interpretation happen each time I revisit a work of his. And I look forward to those opportunities in the new works I undertake. It is because he has given us all so much to decipher in the notes and rhythms themselves, waiting to be discovered and released. But now on to you, the listener. While music is no doubt subjective, there is a remarkable amount of consistency in our reactions to most music. This Lent I have offered music that is slightly more introspective during this penitential season. Perhaps no one has consciously noticed, but it is true. The big reed stops during the postlude have taken a leave of absence and the choir anthems include more serene and sublime selections, such as the Maurice Duruflé Kyrie on Lent I. All of these approaches signify a new affect in Lent, one that will be soon replaced with the joy and ecstasy of Easter. Music is a potent and reliable partner in our journey through the liturgical year. Bach and generations of church musicians after have understood this but it is nothing if it is not shared with those who wish to listen. Soli Deo Gloria. Mark Heiskanen has been Plymouth's Director of Music since September 2017. Originally from Northeast Ohio, Mark has experience and great interest in a diverse range of musical styles including jazz, rock, musical theatre, and gospel. He is thrilled to serve a congregation and staff that values diversity and inclusion in all facets of life. Read his mostly-weekly Music Minute here. Oscar Wilde wrote in an 1889 essay that, “Life imitates Art far more than Art imitates Life.” This famous quote speaks directly to a very active topic in the church world about the boundaries of Sacred Culture and Popular Culture. What is appropriate for worship or to be used as devotional material in the Church? Do the materials or music need to have Sacred Intention at the time of creation or is borrowing from one to the other okay? I want us to reflect on this and to offer a practical devotional practice this Lent to help us Go Deeper whenever a popular song on the radio or so called “secular” NPR story pulls at the Sacred parts of our Souls. The Church has traditionally liked to think of itself as part of the cohort of institutions protecting and operating within the first definition of culture—that of the academy and synonymous with high culture and authority. That is an unfortunate category for us to place ourselves. We should be the movement-makers. I would argue that we really need to be intentionally in the business and the artistic process of creating and aligning with Popular Culture—the third and more intimate definition with daily, lived, deep, embodied, real Christian living and practice. How are we still producing meaning? How are we working to be relevant and interesting to those whom have never thought Church was an option? How can we find God in the Secular and then make it Sacred? Church is in the business of Signifying Practices that make life and living better, more whole, and deeper! Even as a Mainline Minister, the greatest gift of growing-up Evangelical Christian that I cling to and still believe from the depths of my heart and lived experience is a lack of boundary between the Sacred and Secular parts of life. God is working in and through everything. “Prepare my heart,” O God, we pray, “and may I find you in every way.” This doesn’t mean that they like “the world,”, but it means that they use and incorporate popular culture into the church in order to transform it into church culture. My favorite “hymn” growing-up was, and this is not a joke, “I’m a Believer” by the Monkees. It was modified, of course, from the original love song to be about God. As Progressive Mainliners, we have amazing worship together on Sundays, and I do not suggest changing the authenticity of who we are and our tradition with that part of who we are and what we do here. If anything, it makes us cool and appealing to new generations that we have tradition and liturgy. Our worship is awesome and unique. We should, however, go deeper and find God in the popular culture songs that move our souls and hearts. An example, for me, is a song that has been on the radio recently and on the Charts called, “You’re Someone Else,” by the group Flora Cash. What do you hear resonate with you? Loneliness, hope, potential, loss, isolation, liberation, God? Where is God working through this music or lyrics? Have you ever tried to be someone else? How did that go for you? How were you transformed? Are you still trying to be someone else—a hero, a villain, a parent, a celebrity? All of us have time to listen to the radio or NPR. Music is all around us now with Spotify and Pandora. Let’s turn it into a Spiritual Practice. At the end of a song, a segment, a story you hear pray for yourself or for someone else out there also listening to it or implicated in it. Pray for the hope to go on and to live in authenticity. Journal based on a favorite song. Draw a picture of how you feel. Turn the ordinary into the deeply extraordinary. This is the future of Christianity—we must again be in the camp of the signifying practices and cultural totems that really mean and feel and sing something to diverse people. Let’s find ways to get beyond the surface of things together as a community of faith and go deeper again. What will it take for YOU to go deeper? All of this art was a theological reflection on our 2019 congregational theme: Go Deeper. All of us are rooted in the soil of Christian spirituality, but to get down into the richest nutrients and the aquifers of the Spirit, we need to go deeper in our faith. And Lent is a great time to do that! Many of us in the Protestant traditions of the Christian household are less familiar with spiritual practices beyond daily Bible reading that will help us to go deeper in our sense of God’s presence in our lives. What’s more, we often don’t know where to turn. And even though I often hear from our members that they want deeper spiritual lives, we are seldom overrun by crowds when we offer spirituality workshops and retreats. Want to try it out on your own? That’s certainly a place to start during Lent. One entry point is the UCC Lenten Devotional that our deacons are offering to you each Sunday…it’s available between services with a suggested donation of $5…but if you don’t have the five bucks, don’t sweat it! Sometimes, I wonder if, as Anthony de Mello suggests, “People would rather have a definition than an experience.” However, definitions won’t help us go deeper in our faith. Another resource for you to read (and most people at Plymouth love to read!) is from UCC author and clergywoman Jane Vennard, who formerly taught at the Iliff School of Theology (and she was my spiritual director, too!). Fully Awake and Truly Alive: Spiritual Practices to Nurture Your Soul is a fantastic volume that will help you explore spiritual practices that will allow you to go deeper. Maybe you want to dip your toe into Centering Prayer at Plymouth (Mondays, noon – 1:30 or Tuesdays, 5:30 – 6:30)…it’s a great way to enter the quiet center! Or drop by our outdoor Labyrinth and walk anytime it’s not covered with snow! Whatever your spiritual practice this Lent, I hope that it deepens your relationship with the Holy One, who is there to meet you, befriend you, and guide you. P.S. Dinner Church was a great success! Join us for our next Dinner Church at 6:00 p.m. on Sunday, April 7 (for ham, scalloped potatoes, veggie shepherd’s pie, and great discussion and worship). I did not grow up with the tradition of Lent. I came to it when I moved into the United Church of Christ in the 1980s. Since then I have learned layers of meaning for the season and traditions of Lent. Lent – derived from the Old English word meaning “spring season” and the Old German word meaning “lengthening of days. Lent – a penitential season of 40 days in the Christian liturgical calendar; in the 2nd, 3rd and 4th century church, a time of final examination and catechesis for those wishing to join the faith at the Easter Vigil. Lent – a time of fasting, study and penitence; also a season to explore new avenues of prayer. Lent – a faith journey from Ash Wednesday to Holy Thursday; a time to travel wilderness paths of spiritual reflection; a time to go deeper putting our faith roots down into the soil of God’s love. The proverbial Lenten journey is what we make of it each year. It can be a time to add a spiritual discipline to your life in a search for spiritual renewal. It can be a time to abstain from an activity in order to have more time for just Being. It can be a preparation time for the new life of spring, a time to plant seeds literally and metaphorically. A time to till the earth, spread compost and start the garden as a spiritual action. It’s a time for listening in new ways to our souls, to God’s wisdom that lives within us as well as in scripture and tradition. our ongoing Sunday morning Christian Formation classes for all ages at 10 a.m.
the Congregational Life Bingo Night, Friday, 3/15. Find more info on all these activities in Plymouth’s Thursday “Overview” email. Above all this Lent find a way to call your spirit back from aimless wandering. Call your spirit to an intentional journey following Jesus the pioneer and model of our faith in God. ... Turn off that cellphone, computer, and remote control. Open the door, then close it behind you. Call your spirit back. It may be caught in corners and creases of shame, judgment, and human abuse. You must call in a way that your spirit will want to return. Speak to it as you would to a beloved child. The Rev. Jane Anne Ferguson, Associate, Minister, is a writer, storyteller, and contributor to Feasting on the Word, a popular biblical commentary. She is also the writer of sermon-stories.com, a lectionary-based story-commentary series. Learn more about Jane Ann here. ...unless you really want to, of course. But it's not the only option for Lent. Find the event or practice that allows you to make Lent a time to deepen and connect with God and community. And, of course, see you at Sunday worship, March 10 through Easter Sunday, April 21. Spring and Lent are coming! Even though as I write this to you it is snowy and 21 degrees according to the thermometer on our deck! Still deep under the frozen ground, the roots of our trees and perennials are growing and the seeds we scattered in the fall are germinating. There is life deep down! Life is always stirring deep in our souls as well, no matter the outer state of our lives. This Lenten season (which begins Ash Wednesday, March 6, with our annual 6:15 p.m. soup supper and Ash Wednesday service at 7:00 p.m.) we are “Going Deeper.” As a faith community, I invite you to join with me and with one another as we put the roots of our faith deeper within the soil of God’s love in all our worship, formation, outreach and fellowship activities. To further your Lenten journey, please join your Plymouth family in a time of reflection, creativity and fellowship at our first Plymouth intergenerational art and spiritual retreat, Going Deeper: Putting Down Soul Roots, March 8-10. We will explore and follow the life of trees through art projects for ALL ages and ALL art experience levels, reflection on poetry and scripture, prayer, fun and fellowship. Friday evening, 3/8, from 6:30-8:30 and Saturday, 3/9, 9:30-11:45 and 1:00-3:00, led by our artist/theologian-in-residence, the Rev. Dr. Linda Privitera. Do you know what trees and people have in common? The “giveaway” answer is that both function much better in community. The recent NY Times best-seller, The Hidden Life of Trees by Peter Wohlleben, tells us that isolated or solitary trees do not live as long as those in a forest. Sustenance comes from a network now being studied by researchers about how trees communicate, warn of danger, feed, sustain and nurture even the weaker members of the forest. With this background knowledge from the science of creation, our retreat time with Linda will function on the assumption that making art is an intuitive and concrete way of knowing. Engaging in a variety of art experiences around the theme of trees, all designed for fun, we will also engage reflective processes to help us listen to the journey of the soul, deepening our understanding of how God’s Spirit is working within us individually and communally. Our artistic and spiritual retreat journey this weekend will be grounded in Jesus’ time in the “wilderness,” which is the traditional gospel lesson for the beginning of Lent. Expanding on the traditional view of wilderness time as a time of trial, we will journey with Jesus in a soul-enriching time, thinking about what he might have gained from his time in nature. It is no surprise to us here in Colorado and particularly in our community, rich in environmental scientists, that God’s creation has so much to teach us about what really matters in this world. 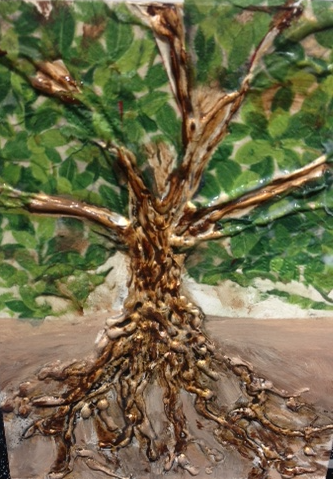 Our artistic and spiritual work will culminate with an Lenten art installation of trees, roots, and connections created by YOU under Linda’s leadership and direction. The plan is that together, adults, youth and children, will create a network of roots connecting our individual art pieces of trees and roots, and linking it all to the base of the cross in the sanctuary which will “grow” a large system of roots joining everything together. Come and see what you can create with zip ties, twisty wires, braided heavy twine and raffia! How will hot glue guns, stencils highlighting the work of Gustav Klimt, rocks, and your own creativity shape a forest of spiritual connections that deepen the roots of our faith community? Come and find out! Sign up now by clicking this link.........or registering at the “Going Deeper” Art Weekend table in Fellowship Hall, February 23 and March 3 before and after worship times. College students, youth, and kids are free! (But please register so we know you’re coming.) Adults, $35.00 and Families with two adults, $60.00. Don’t let finances get in the way...assistance is available...just talk to me or send me an email. Improve worship attendance (309 in 2018; aim for 320 in 2019). This is a goal for ALL of us who form Plymouth: if you’re in town, come to church! When you aren’t here, we miss you…and you miss out on the gift of Plymouth! Increase pledging and fulfillment of pledges. The Stewardship Board will be working this year to reach folks with the ways your giving to Plymouth helps change lives. Improve visitor welcome experience. What is it like to walk into Plymouth on a Sunday? Are you greeted in worship and coffee hour? Welcomed at the Visitor Information Desk? Engaged in conversation if you are using a blue mug? Evaluate and update Building Use fee structure & fees for weddings and funerals. We need to ensure that we are covering costs for things like utilities, deferred maintenance, and custodial care and building. Drive leadership development and nominating process. We are in the process of recasting the Nominating Committee as a Leadership Development Committee that will work year-round to help develop new leaders and identify the right person for the right ministry. Glean and use results from Adaptive Challenge Task Force on Age-Related Engagement. A new task force is looking for ways to engage folks in their 20s and 30s more fully. Integrate new Business Manager into Council/Treasurer/Budget & Finance processes. As we look toward filling this new half-time position, we’ll need to work to help him or her mesh well with Plymouth. Evaluate current strategic plan and identify key areas needed to complete the plan. Take steps toward next process. We still have some work to do with the 2015 Strategic Plan, and we’re due for a new process soon! Getting members to sign on to F1Go and use it. If you haven’t used our new F1Go database, you have a treat in store: a great smartphone app and an internet-based site make getting information really easy…wherever you are! Identify congregational theme for 2019 (“Go Deeper”) and drive it. I look forward to working with YOU to help engage these goals as we delve into an exciting year at Plymouth when together we will Go Deeper! Lucky for us, we are facing these extraordinary times with the safety and security of a Christian faith tradition grounded first and foremost in the idea of eternal hope—both for this Realm and the next. We are, if we do Christianity right, embedded in a culture and even a Savior of hope. Moreover, somewhat ironically, this liturgical season between Epiphany (anything but normal) and Lent (certainly strange) is actually a short month of “Ordinary Time” in the midst of liturgical seasons of great instability. This is, whatever truth we find in it, technically Ordinary Time in the Church Year. As we all grapple to find and remember our collective Baptismal Call to Hope and to seeking God in all things and in every time, I would like to invite you to join me in a new practice. Our Baptisms call us to look forward in hope to a better day rather than backwards towards how it was before our current perceived state of disunion. Hear me on this: Things will never again be the way they were before or how they were when you were a kid, so our greatest hope lies in God and in uncovering the immense potential of a New Ordinary Time. Hope isn’t a thing of the past. Hope is the way of seeing the gifts of now. It is trusting that God can make good come from even the worst imaginable and then acting and working to do our part to make that envisioned future of union possible… come tomorrow or come three lifetimes from now. As the story goes, on May 12, 1940, when the tulips were still blooming, the future Queen Juliana of the Netherlands boarded a ship for Ottawa for safe keeping during the ravages of World War II. In Canada, she met an unmatched sense of hospitality, care, and true national mutuality. The Canadian government even went to the lengths to declare the hospital room where Queen Juliana gave birth to Princess Margriet to be official Dutch Territory so as to make the birth completely Dutch. In 1945, when she finally got home, Queen Juliana sent 100,000 bulbs to the City of Ottawa and then another 20,000 plus bulbs to the hospital that had shown such understanding and went to such lengths during the birth of Margriet. 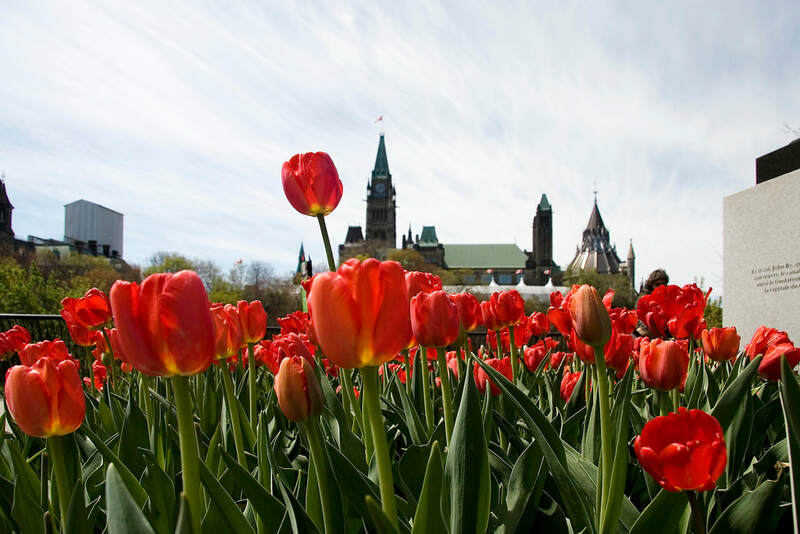 Every year, for the rest of her life, Queen Juliana sent tulip bulbs over the North Atlantic to the Ottawa as a sign of union and connection. That is the story, as I have heard it, of the Tulips of Ottawa. Why does that matter today? The New Ordinary, after a time of great darkness and international disunion like we have never seen before in history, still has signs of flowers, or relationship, and of hope. The uncertainty and disunion in the world today cannot even begin to be measured against 1940, but still the sense of despondence and pessimism, particularly in the Mainline Progressive Church, is concerning. We cannot start over from 1957. * We can only start over in hope from today. This is our New Ordinary Time with which we have to work and create anew. At the end of WWII, the people of the Netherlands and Canada couldn’t wish away the pain and the loss, but they could see what God was leading them to in a “new ordinary” with new potential for good, for connection, and for tulips. This spring and summer in Ottawa Canada, and probably forever into the future even after the origin story is forgotten by human memory, tulips will bloom along the canals and in the parks and every public place. The Realm with which we have to work and within which we are called by our Baptisms to plant bulbs of hope will never again be 1957, 1992, 2007, or even yesterday. The only place where we can plant flowers of union, is today. It is your Baptismal Covenant to look for any ground that might be ready for flowers of union between people even in unexpected times. I was happy and pleasantly surprised when I received an email a few weeks ago from Distinguished Concerts International New York inquiring if I and the Chancel Choir wished to take part in a choral concert at the Lincoln Center in New York City next spring. What had happened is this production company saw our YouTube video of us singing The Ground by Ola Gjeilo from early last year (scroll to the end of this post to view), and enjoyed the musicality and passion in our rendering. As they are assembling a choir of 150-200 singers nationwide to take part in an Ola Gjeilo concert on March 16, 2020 in Alice Tully Hall, they hoped we would decide to join them. And, of course, we said yes! We have about 20 singers currently signed up for the trip, which will be from March 13-17 and include time to enjoy the city but also stringent rehearsals over the weekend. It is especially pleasing that the composer himself will be present and will be featured on the piano. While this is just fantastic news and an honor to be selected for and to be a part of, I can't help but to muse on how this reflects on what is happening at Plymouth in general. What I see in the church is grand plans. The scope has always impressed me: vision without overreaching. Growth can be measured in terms of numbers and is the most obvious manner to do so. But creative vision within our means, in my view, even more so. And if the path is not available at the time, have the courage to create one. For the music program, I see this manifest in several ways. I aspire to provide creative programming ever mindful to the volunteers who graciously give of their time and talents. We currently have one staff singer to support our choral sound and inspire our singers, as well as to be a resource for professional performance. The Plymouth Brass is a professional brass ensemble we are blessed to hear in worship several times each year. The 6pm service offers an evening prayer worship experience with music varied from Celtic and traditional to jazz and gospel. All in all, while our music program will always be supported by the backbone of our wonderful volunteers, there is a professional mindset that propels our offerings, whether it be by professional or experienced participants in our midst, or simply the vision of bringing musical excellence to all the worship services. And always with the intention of service. 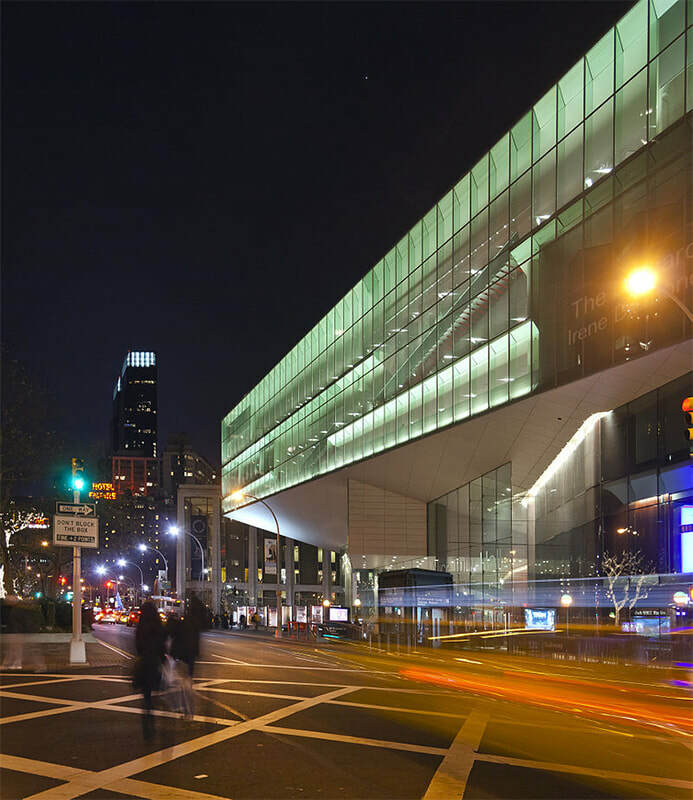 So yes, we're going to the Lincoln Center and will have an amazing musical experience in one of the premiere concert venues in the world. But this opportunity is a sign of good things afoot here at Plymouth and I'm glad to be able to mix myself into it. For those of us who sometimes struggle with the title and history of the name “Christian,” I might suggest that the coolest rebranding we could do as an institution would be to call ourselves Water Walkers! Can you imagine the logos we could develop? In all seriousness, Scripture is all about risk-taking and learning to reinvent ourselves. From Genesis to Proverbs to Matthew, we find sayings and stories that remind us that life changes, God is with us, and we have to take risks to make a difference. Life is about learning to walk on the water… and learning to swim with joy when it just doesn’t work out the first time. 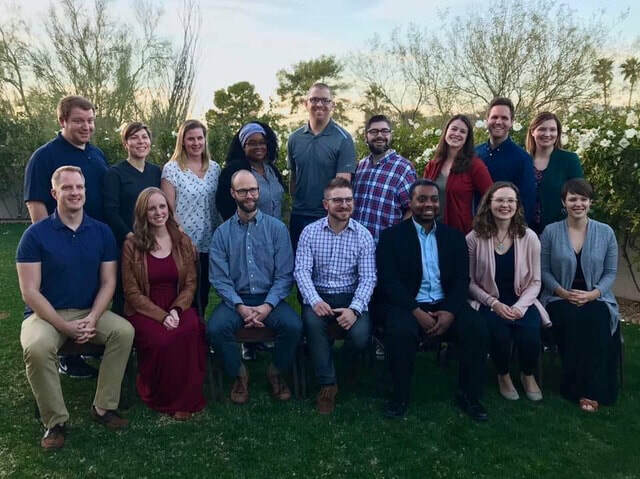 At my recent younger clergy leadership cohort (The Next Generation Leadership Initiative) last week, we focused on the idea of adaptive challenge and adaptive leadership. One of the first lessons The Pension Boards wanted to relate to us before we could get into case studies was the difference between Authority and Leadership. In your life, in your relationships, in your spirituality…are you currently trying to be a leader or an authority? What are the things you are learning through? What experiments are you running to try to come to new solutions or ways of being? Our religion is built on a tradition of stories about radical, adaptive experiments like walking on water. We have nothing to fear. We certainly should be hard to embarrass given the funny stories in our tradition and Scripture! We are the water walkers… and sometimes jubilant swimmers. It is Christianity that should inspire us to take risks rather than inspiring us to worry and stress. I pray for all of us, with or without New Year’s Resolutions, that we all resolve to be leaders throughout our different contexts in these times of the unknown, unprecedented, and yet still emerging change. Turns out, the greatest risk is forgetting that risk is our religion. I confess that each morning one of the first things I do is look at the News app on my phone to see what is happening. Yesterday the most useful and uplifting thing I found was a new recipe for dinner. The news which is dominating the headlines is about governmental discord and the mistreatment of American people, as well as those waiting at our border, by the officials who are supposed to be serving the people. It’s discouraging and overwhelming, isn’t it? Should I just ignore the news for my own peace of mind? That doesn’t seem to be right. Where is the wisdom I need to read the news with any kind of equilibrium? 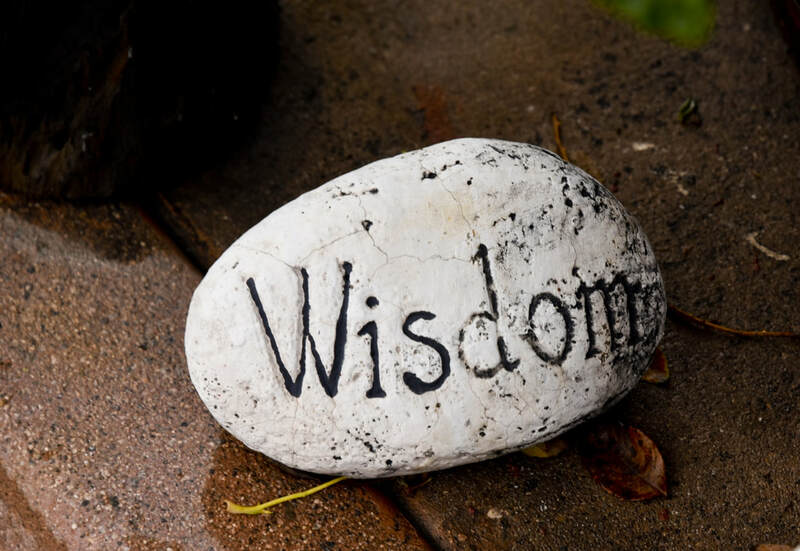 The definition of “wisdom” from the online etymological dictionary is: "knowledge, learning, experience.” The word descends from Old English, German and Norse. The Greek word for wisdom, “sophia,” is a bit broader in meaning: "skill, knowledge of, acquaintance with; sound judgment, practical wisdom; cunning, shrewdness; philosophy." When the Hebrew scriptures were translated into Greek early in Christian history, “sophia” became the word for wisdom as it was personified in a female form in the book of Proverbs and the Book of Wisdom. Where in these definitions do we find the “wisdom” to look at our world, our country, in these times? We can be well-informed with knowledge about events. We can learn about policies and points of view we do not understand. We can consider this information with shrewdness, sound judgment, practical sense, philosophical reasoning and maybe, even some cunning. We can measure all this against our own experiences. And still we can be overwhelmed by all that is happening! I need more solid ground. The female form of wisdom in the ancient Hebrew scriptures, “Sophia,” became synonymous with “divine or holy wisdom.” Is there a clue here? Is wisdom truly found when we include a spiritual component to our search? In her book, Welcome to the Wisdom of the World and Its Meaning for You, Joan Chittester investigates the five major faith traditions of the world to discover the meaning of wisdom in a sacred and holy context. She asks the question of what it means to be a “holy person” and concludes that the essence of holiness and maturity lies in the cultivation of spiritual consciousness. Holy people throughout the ages in all faiths “sought to grow beyond the husk to the core of life, beyond the manuals of spiritual life to the essence of the spiritual life.”[i] Chittester relates a story from the Islamic Sufi tradition to illustrate this. ‘No, not divine,’ the holy one said. ‘Oh, dear, no,’ the holy one said. ‘Then what did your become?’, the seeker asked. This is my prayer for myself and for Plymouth this year as we continue in all of our ministries of worship, study, learning, outreach, social justice and fellowship. May we become awake in ways we have yet to experience to the Divine presence within us, shaping us, nurturing and challenging us! May we become awake as we seek to respond in love to our overwhelming times rather than react in fear or anger! May we become awake to life moment by moment as we breathe in the joy of creation, as we love even our enemies, as we seek circles of community rather than levels of rigid hierarchy! May we become awake to the life of Jesus that lives in each of us! [i]Chittester, Joan, Welcome to the Wisdom of the Word and Its Meaning for You; Universal Spiritual Insights Distilled From Five Religious Traditions, (Grand Rapids, MI: William B. Erdmans Publishing Company, 2007), xiv).